But we are nearing the end of February and Spring always comes. So let’s move on to a paint project ok?! Today I’m sharing how I upcycled with paint and glaze. 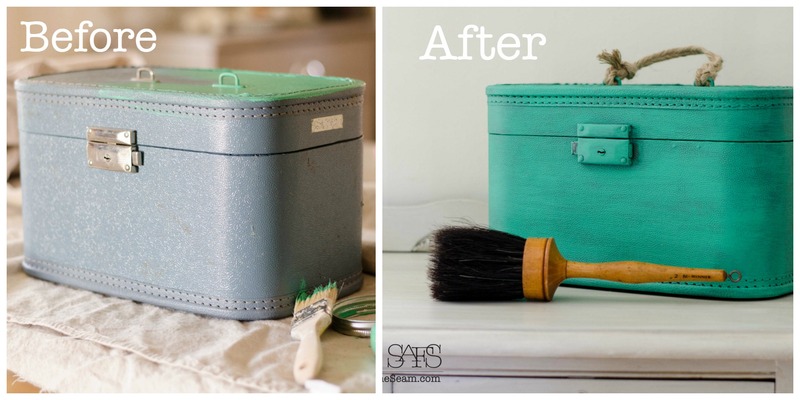 This old suitcase got a new life! 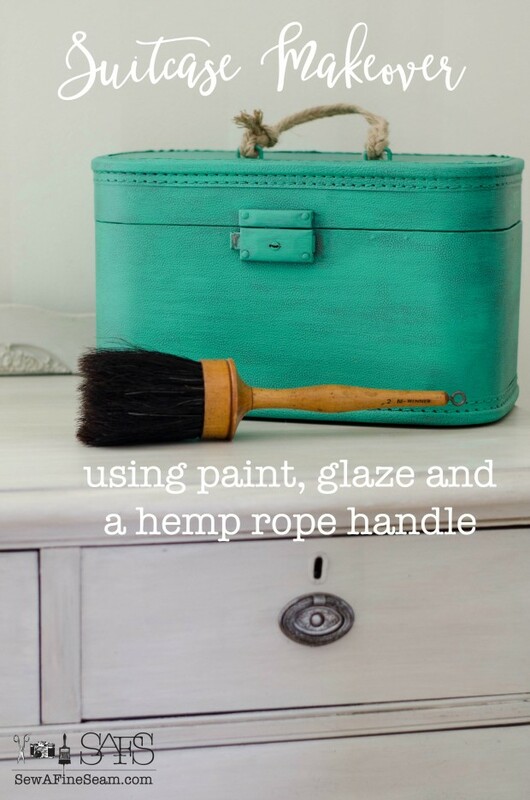 Paint and glaze and a hemp rope handle turned this ready-for-the-dumpster piece into a fun and happy little storage case! I think this little suitcase was in some of my Grandmas things when we were clearing her house out last year. Somehow in the shuffle of getting my ‘treasures’ home, the handle on this broke. My husband was going to throw it out as ‘it’s not useable now’, he said. I wasn’t so sure about tossing it and hung onto it for a bit. And decided a new handle could be created. 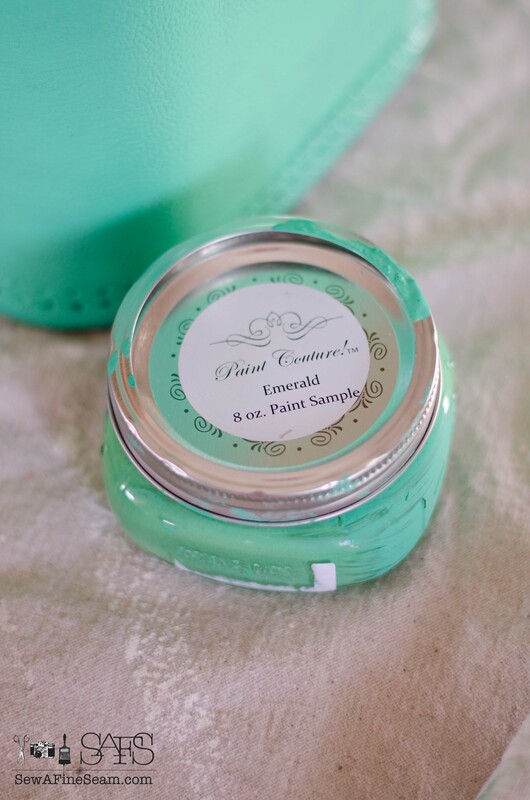 I painted it a fun, bright green color – Emerald from Paint Couture. This color is no longer a PC color but we do have a lot of really cool colors to choose from. I did this makeover a year ago and am just now getting around to showing it to you! Paint Couture is 100% acrylic, goes on smoothly and is just a dream to work with. I’ve been a bit silent about paint for the past several months – I carried a line of paint very briefly that was not all it had been promised to be. 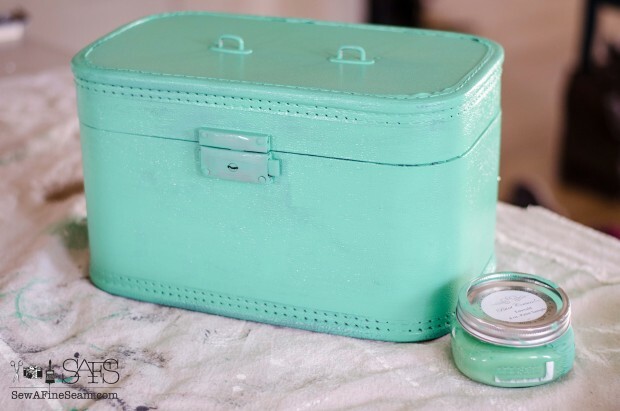 I lost money, had to redo projects, and though I’d found Paint Couture in the midst of the mess and loved it, I just wasn’t too keen on talking about paint for awhile! I’ve been selling the Paint Couture at my brick and mortar shop for over a year now and I have to say it is the best paint I’ve ever used. All natural formula was introduced a few months after I joined the PC team and it’s lovely. I’ve used a lot of different paints over the past few years and this one is the best. It goes on as lovely and smoothly as some others I’ve used, but the thing that makes it better is that it dries harder and is much more durable. And the accompanying products, the glazes, metallics, embossing paste, crust, lacquer finish – it’s all amazing and gives the best options for whatever look you want to create. The fact that it’s now all natural is something many other brands cannot truly boast. After painting the piece I decided to try the zinc glaze – not a great idea on this emerald green color – too dark. So once the glaze dried I went back over the piece with the green paint using a dry brush method. I had some jute rope in my stash that I used for a handle – just tied it around the hardware that was still attached to the suitcase. The hardware was fine, the plastic handle was what broke. I think the rope handle is cuter than the old plastic handle anyway! Here is a side-by-side before and after. I never did like that color of blue very well. The old brush was also in my Grandma’s things. I have no idea what she used it for but I thought it was cool so I nabbed it along with all the other cool stuff I found. What a wonderful idea! 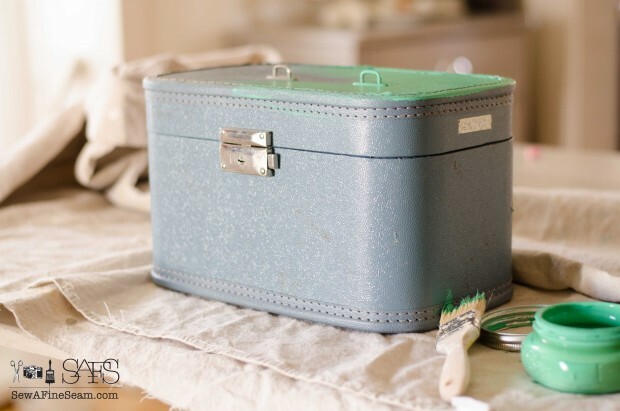 I have one of these suitcases and will be mulling over painting it. Have a brush similar to yours. Mom used it with talcum powder on our nevks sfter she gave us a haircut. 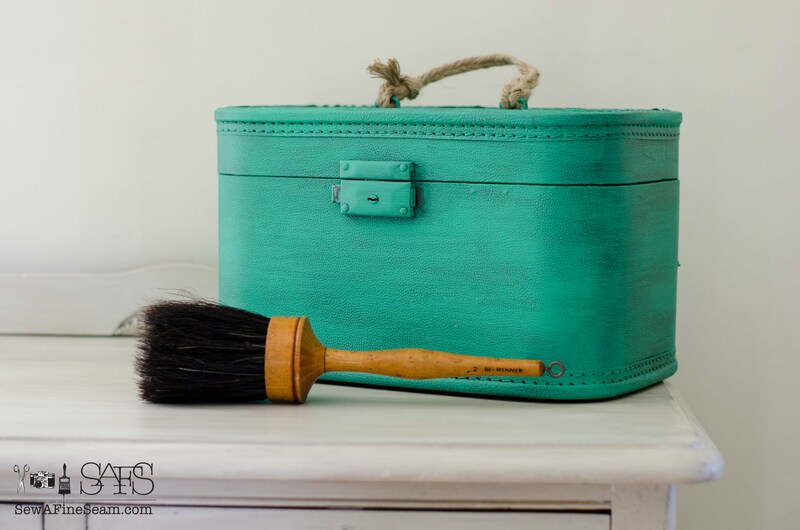 painting old suitcases is so fun – freshens them up 🙂 Interesting about the brush! For some reason I think old brushes are cool. 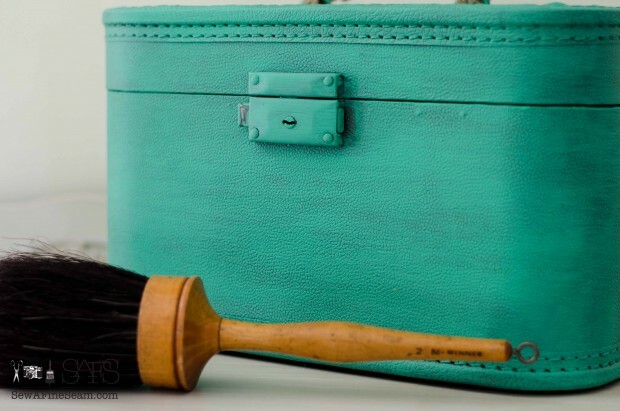 I have a train case which is 39 years old and the same color of blue as the one shown. It’s in fair condition with the handle still intact but the inside mirror has been gone for years. I still use it for toiletries when I travel but your paint idea sounds just what it needs. I wonder if spray paint would work? Hi Tricia! I’m sure spray paint would work! I think I’ve seen that done on a blog somewhere 🙂 How cool that you still use yours – I love the look of them! How fun! Love what you did. That old brush is very cool. Perfect for you! 🙂 I love it! Maybe someday I’ll even find a use for it! LOL!